In December we teamed up with award winning blogger and interior stylist Maxine Brady to launch #BrightBloggang – a brand new and exclusive interior and lifestyle blogger and Instagrammer meet up in Brighton. The first #BrightBloggang meet up took place at the wonderful Cocktail Shack bar within Artist Residence hotel, overlooking Brighton’s Regency Square and the i360. 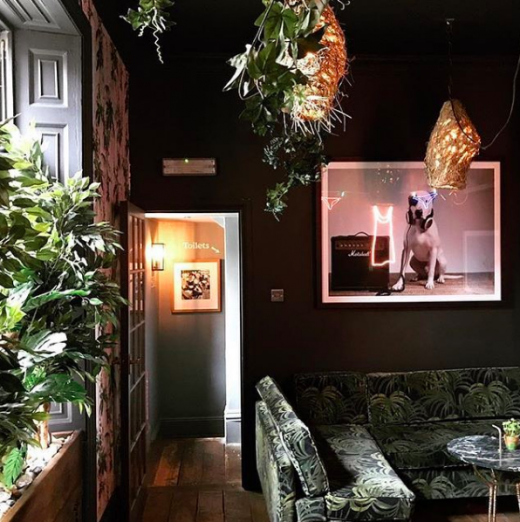 The invite-only event saw 20 local bloggers and Instagrammers take over the secret downstairs bar, which everyone was delighted to access through an authentic moving bookcase. The venues dark and decadent decor, including House of Hackney fabrics and an abundance of hanging foliage and contemporary art was a huge hit with our decor-loving guests. The event was an opportunity to bring the online community into the real world, putting faces to names and providing a friendly space to network and share ideas. Due to the success of the Christmas meet up and multiple requests from its attendees, we can confirm we’ll be organising follow up events throughout 2018. What can we say – we just had so much fun we can’t wait to do it again! Towards the end of January we’re launching an Instagram giveaway to win event goody bags. We have eight available and they are full of amazing treats including a Foreo Luna Mini, a scented candle from Dunelm, Steamer Trading kitchen items and Tisserand goodies, as well as a number of other lovely treats. Make sure you follow Jasmin @brickdustbaby and Maxine @welovehomeblog on Instagram for details on how to enter.